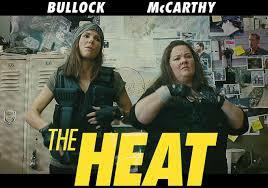 I Went to see the movie, “The Heat” with Sandra Bullock and Melissa McCarthy and have to say that it was funny but extremely dirty. So many vulgar comments, curse words and nasty scenes made it a little too much for anyone to forget. Yes most movies bring in curse words but this one topped the cake. I would say it had to be the worst one I’ve seen. Now that I have complained about the outrageous and filthy parts of this movie, I will proceed. This movie had the whole audience laughing at parts that were actually good comedy. One part where Melissa McCarthy (Mullins) talks about the dress of her partner, Sandra Bullock (Ashburn) had me in tears. Then another scene where she talked about a man’s skin color being albino kept the audience screaming hilariously for several minutes throughout the show. Who won the title of best character? I would have to say McCarthy with her appearance and unruly behavior made her the pick of the group. One part where she ran after a criminal and threw a watermelon at him highlighted her acting ability. Another part where she was dancing with Bullock made another outlandish scene that was hard to forget. Her appearance alone made one guess if she was the criminal too. If I had to give a score for comedy it would be a five stars. To my disappointment in the crude lewdness that one can’t forget, I would give it a two stars. This movie you don’t want to take children to.